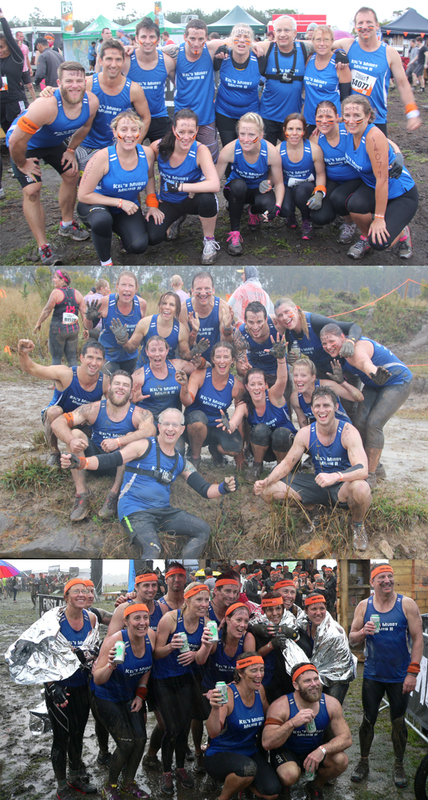 Tough Mudder – 19 participants, 12 support crew, 19km, 18 obstacles – 5.5hrs! Great work team! I want to help YOU achieve your ultimate health and fitness goals. Does time get away from you? Do you find it hard to fit exercise into your weekly routine? Life gets busy for everyone – work, family and other commitments. But don’t forgot to look after Number 1 – YOU! We are far better able, and more productive, towards looking after everything else in our lives, if we care for ourselves first. Let ME help YOU to become a HAPPIER, HEALTHIER, YOU!!! Click to see my range of Services available – including Altitude Training! Personal Training available in Morningside (Brisbane). ♥ Achieve your results in a quicker time frame. ♥ Motivation – give you that extra push with training. ♥ Accountability – knowing someone is monitoring your training helps keep you on track. ♥ Safety – ensure you are doing exercises with correct technique. ♥ Confidence – increased self esteem from feeling capable and seeing results. ♥ Knowledge – to learn why and when you should be doing things and better understand all aspects of training. ♥ Challenge yourself – see how far that body of yours can be pushed. ♥ Injury management – get that body working as best as it can again following injury. ♥ Variety – if boredom is an issue for you, changing your programs on a regular basis will help to avoid this. ♥ Distraction – takes your mind off the hard work, makes training fun! 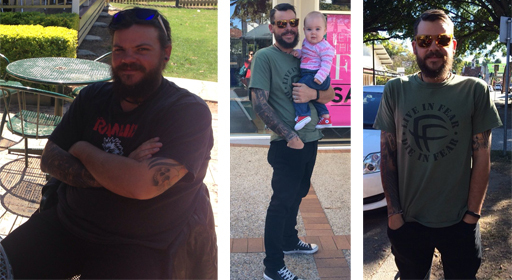 This amazing man lost 20.3kg in 4 months! He exceeded his goal weight by 7kg and couldn’t be happier. Gareth’s self confidence is booming now, his metabolism in firing so he can be pretty flexible with his food now. The hard yards of weight training, cardio and following his food guidelines certainly paid off. Congratulations matey so proud of your dedication! Congratulations to Teresa who took home 3 trophies at the INBA Queensland Titles in the Fitness Model Divisions in September 2014! Awesome effort, especially as we were contending with her being almost too lean for this category. Teresa also competed at the Nationals in October but unfortunately didn’t place, there was some amazing talent up on stage – it was a tough gig! Despite not placing at Nationals, Teresa still exceeded all of her goals for competing in 2014, she had a truck load of fun and you could tell on stage she loved every minute of it! Beginning | During | After! We did it again!! Kel’s Muddy Militia completed Sunny Coast again (or not so sunny that day haha) – 14 team members, 14 support crew, 20km and 21 obstacles – completed in 4hrs 15mins smashing our time from last year despite some injuries/set backs along the way. All the team did the extra Mudder Legionnaires Loop. The weather was atrocious and at times freezing – at least it made for a super muddy course this year!! Very different pics from last year. Thanks to our amazing support crew members who braved the awful wet cold muddy weather conditions to cheer us on, feed us snakes and take pics! Thanks to Fiona our team masseuse for relieving our aches and pains post race! There was blood, sweat, tears and pain, even near hypothermia for some – but there was joy, relief, accomplishment and pride when we finished! What a day … another lot of great memories!!! Thanks to all of Kel’s Muddy Militia II for being so awesome!!! Kel’s Muddy Militia CONQUERED TOUGH MUDDER!!!! I was honoured to lead this awesome team for Tough Mudder! 19km of constant rough terrain, 18 obstacles along the way – 19 KMM team members left the start line and after a massive 5 & 1/2hrs, 19 crossed the finish line to receive their well earned orange head bands and beer!! So so proud of all my team and ever appreciative of our 12 support crew that cheered us on along the way, captured some awesome pics for us, and feed us jelly snakes to keep us going! Our team work was evident, our bootcamps had well prepared us for this and getting over those high walls! As the Tough Mudder pledge says – Tough Mudder is not a race, but a challenge – time was never a factor – our aim was to get everyone over the finish line that never thought they’d ever be able to complete a Tough Mudder course! We only had 1 rolled ankle towards the end, but Pam nutted it out to get to the finish line – go girl! Probably an hour of our time was spent with delays waiting at obstacles. A couple team members were shaken by obstacles triggering their fears but they recollected themselves and carried on to the next obstacle! It was hard and most of us struggled in some way – but the girls in our team were so grateful for the guys – their strength really got us through the high obstacles! Despite the pain along the way we all had so much fun and the bond formed from our months of training and getting through this event will always remain! 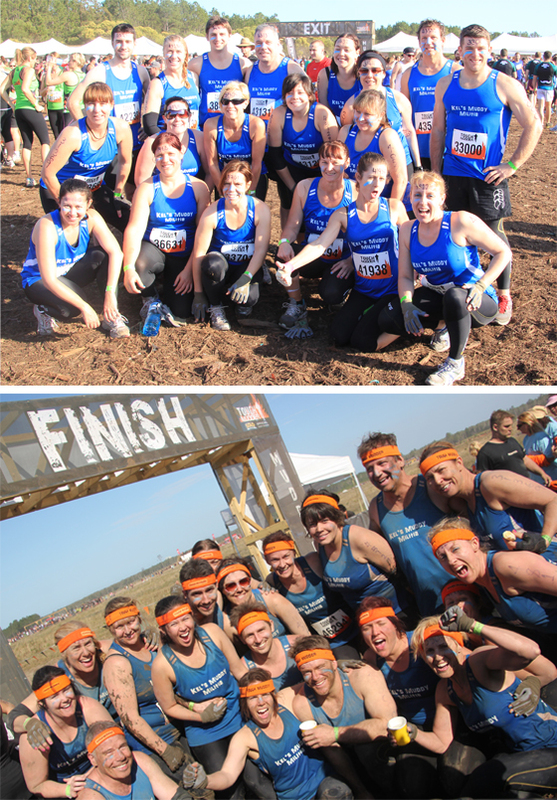 To each and every one who represented Kel’s Muddy Militia at Tough Mudder- thank you, you rock!! 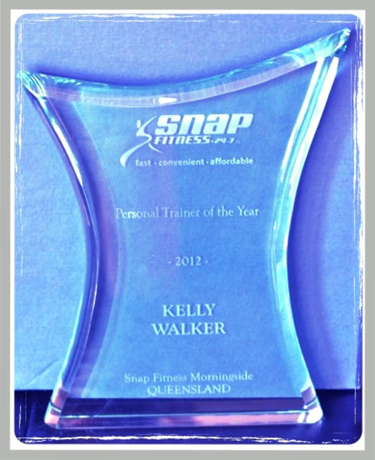 I am honoured to receive the Snap Fitness Australia Personal Trainer of the Year award for 2012! It’s been a huge year for me with so many great achievements with my clients and the growth of our Club and Team at Snap Morningside! Thanks to all my clients for making my job so awesome – you keep me challenged every day. I’m so proud of all your achievements and I love seeing you all achieve your goals and transform your lives with my help!! You rock my world!! Thanks to our awesome team at Morningside Brett, Annette, Emerson, Dean, Sue & Bianca – our team rocks and the club is always a fun place to be in! For once in my life I was actually speechless receiving this award – I’m very proud to have received this recognition! What a great finish to a spectacular year! Top: Lachy, Sarah, Karen, me, Richard, Lize & Deb (Annette B absent). Bottom: Lachy, Karen, Sarah, me, Deb, Annette B & Richard (Lize absent). Another awesome challenge with great results – my amazing team lost a combined weight of 52.1kg over the 8 weeks and Lize had a 2kg lean mass gain which is awesome! 2 divisions this time Weight Loss and Transformation, and the Challenge was run nationally this time. 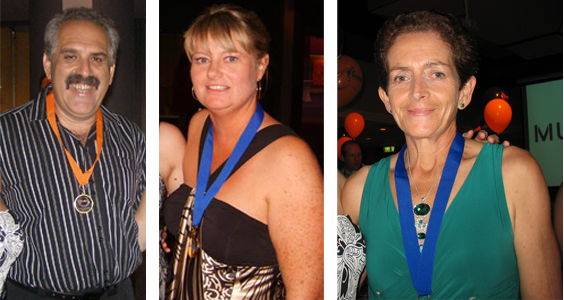 My clients Lachy (Transformation – lost 12.5kg) & Sarah (Weight Loss – lost 12kg) were the winners for our club, and Lachy was also a State finalist for Transformation. Well done team you all look awesome and so happy! Tony, Anne, Deb, Sean, Mark, me, Karen, Sarah and Cheryl (and Katrina absent) – at the awards function! 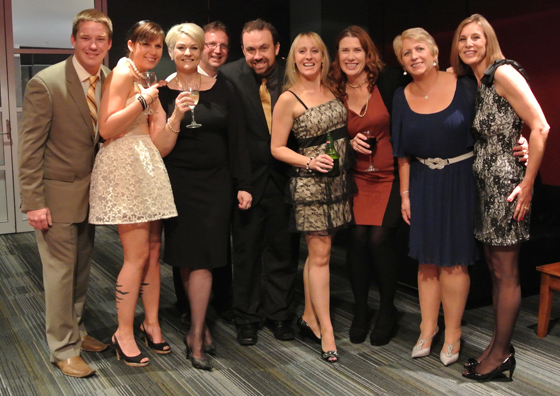 This awesome team of mine lost a combined weight of 62.7kg over the 8 weeks! 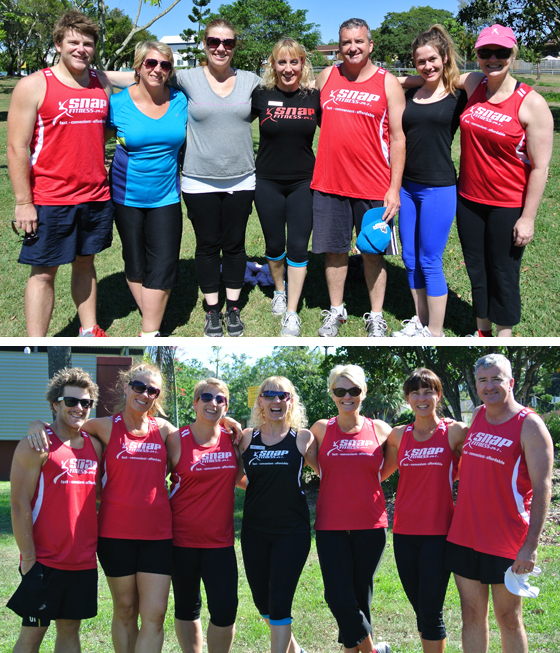 This wasn’t purely a weight loss competition – we had 3 divisions – Weight Loss, Transformation and Fitness – competing over 6 Snap Fitness clubs. We had great success with Sean winning the Fitness division taking home a $1,000 prize cheque; Sarah a finalist in the Weight Loss category; Cheryl a finalist in the Transformation category; and myself a finalist for the Champion Trainer of the Challenge! Awesome work to my team they all worked so hard and it paid off! Looking fabulous! 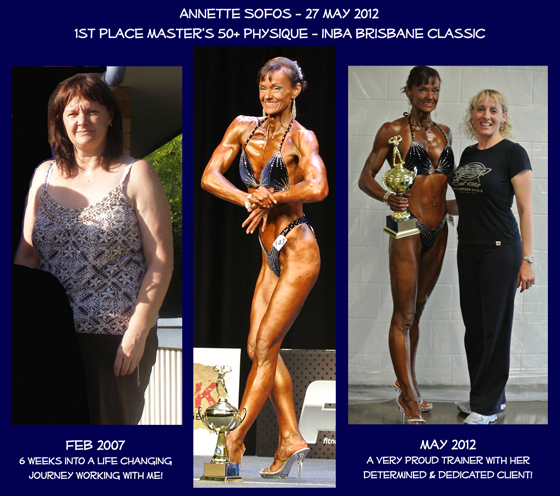 Annette has had an amazing transformation journey over the 5.5 years she’s been training with me! Definitely a new lady and a true inspiration!!! Read her story in testimonials. Greg lost 28kg in 8 months!!! Fantastic effort. Greg leads a more active and healthy lifestyle overall nowadays and is fitter and stronger for his passion of golfing! Consistency with training and sensible eating saw Greg achieve his goal with ease (of course there was a lot of hard work and sweat involved!). The weight kept falling off at every monthly measures and very little lean muscle mass was sacrificed along the way. Now that Greg’s weight loss goal is achieved our training is now tailored to assist his golf game. Keep up the great work Greg! First time figure competitor placed 2nd at the 2008 INBA Qld State Titles Masters 50+ division and 3rd at INBA 2008 Nationals (same division) held at the Gold Coast. Deb has since won the 2010 INBA Qld State Titles Masters 50+ division and took out another 3rd at the INBA 2010 Nationals held in Melbourne. Great work Deb!! !